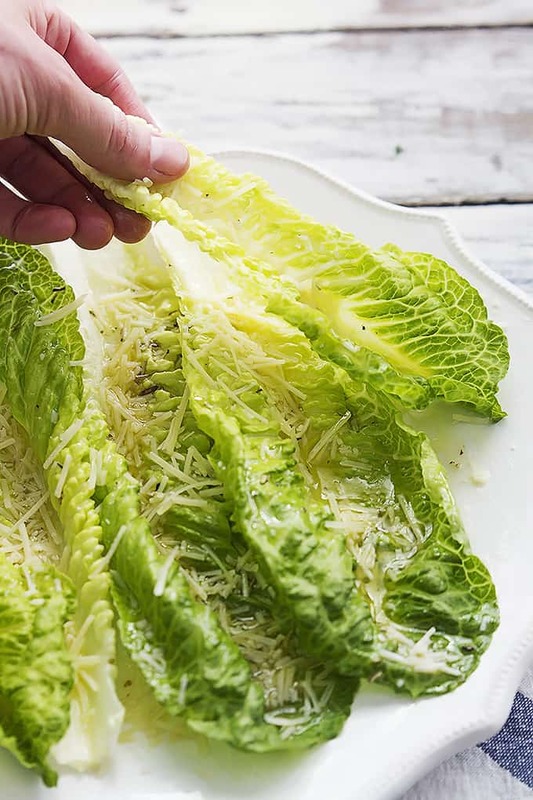 Crunchy romaine leaves topped with Italian dressing and Parmesan cheese! A fun, easy, and tasty new way to serve up salad with this Romaine Finger Salad! Taking a teeny tiny walk down memory lane today… do you mind? So maybe this is a little bit weird but I love finding out what kinds of things people eat for “snacks”. Particularly what people had for a snack when they were growing up. Chips and salsa were a daily snack staple in my house. But another favorite was to grab a piece of wheat bread – not toasted – and top it with cold slices of colbyjack cheese. With a slice of blueberry pomegranate juice. When I was in junior high school, my best friend Abby’s mother would fix us snacks after school or on the weekends and although I always loved them, they were always new to me – and pretty much genius. I still remember the time she gave us a plate of cucumber slices sprinkled with salt. P.S. my husband’s family does the same thing but with vinegar instead of salt. So good. My friend’s mom also served up finger salad on a regular basis. Either for a snack, or as an appetizer or side dish with dinner. A couple of weeks ago I couldn’t get it out of my head and it’s so darn easy that I just had to make it that very day. 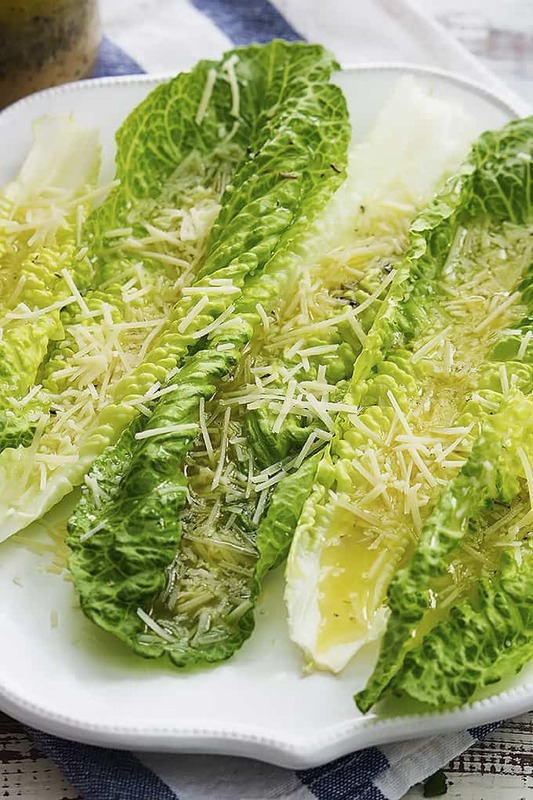 Romaine hearts topped with Italian dressing and parmesan cheese. My husband said he actually likes this better than most traditional salads and I’ve got him convinced that salads are the third greatest food ever so you know this has gotta be good. 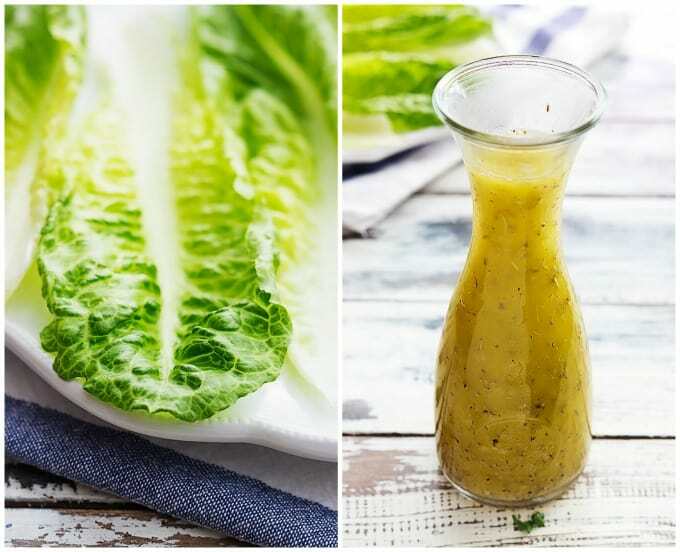 You can use your favorite store-bought Italian salad dressing orrrrrr I’ve included a super easy and totally delicious 2 minute homemade version for you. You’re welcome! And let’s be real, who doesn’t like finger-foods right?? 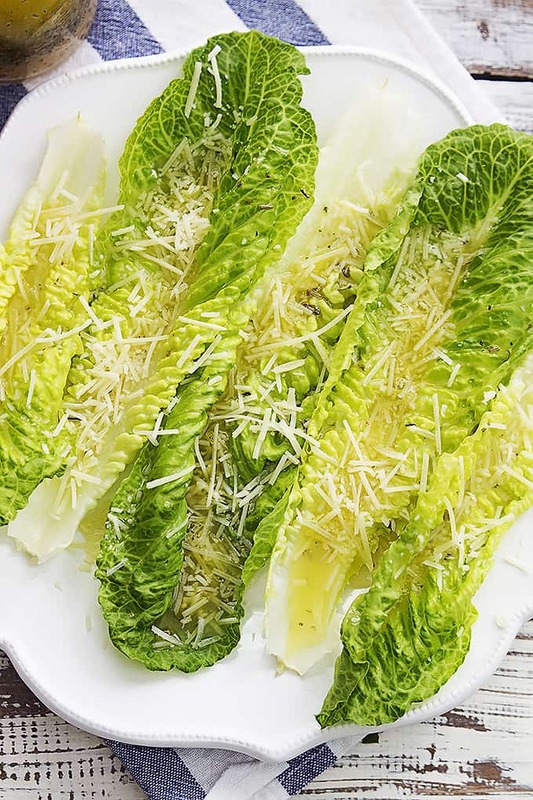 Crunchy romaine leaves topped with Italian dressing and Parmesan cheese! A fun, easy, and tasty new way to serve up salad! Separate the romaine leaves and place them in a single layer on a serving plate/platter. 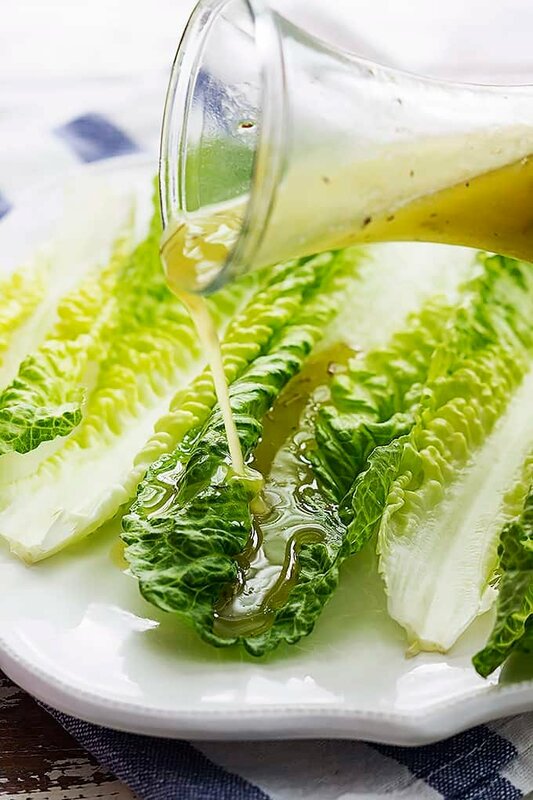 Drizzle romaine leaves with generously with Italian dressing, then sprinkle with cheese to taste. Serve immediately. For the homemade Italian dressing, add all ingredients to a jar, cover, and shake well. Store chilled in an airtight container. The great thing about this recipe is that you can make as much or as little as you need for the number of people you are serving. I usually do 2-3 romaine leaves per person. Cucumber chopped into bite-sized pieces and sort of marinated in a vinegar-Dijon mustard mix is darn good also. Pickied that up in a German restaurant in S. America . Served as an appetizer. 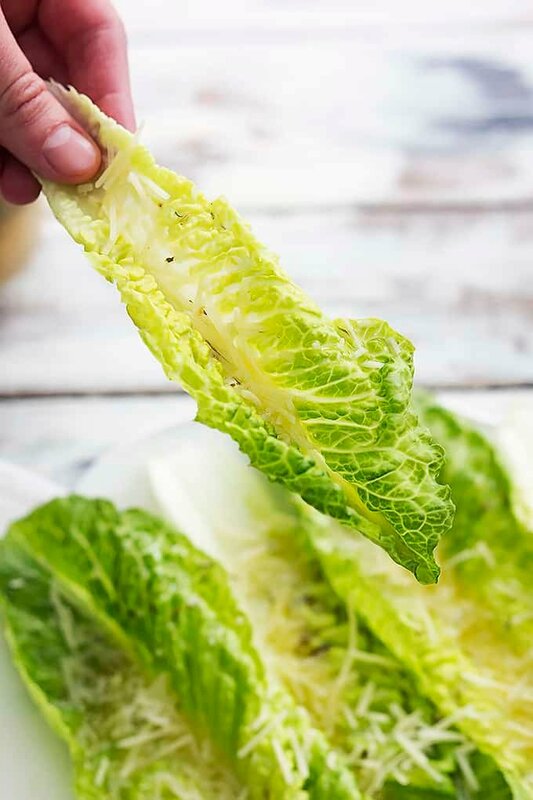 What would you call ” Italian seasoning”for your lettuce dressing? Is there a standard seasoning? How would you go about making your mix? Rodrigo – Italian seasoning is a thing and it is available in the spice aisle however it so easy to make and SO much cheaper than buying already made. Just Google Italian seasoning recipe and you will have many to chose from and you probably have all the ingredients in your spice cabinet. Bon appetit! By “cider vinegar” do you mean apple cider vinegar? My mom used to serve steamed broccoli and steamed artichokes as snacks. It’s so interesting what different people consider snacks! There’s such a wide array of options… I LOVE the idea of a finger salad! This is great. Thanks for sharing! finger food is a must while chatting with friends or while watching movie, so different dishes of finger foods are always needed, this one is a good dish with little labor involved, nice post. Salad is always a must-have dish on my table every meals. It’s super healthy but children are usually not so interested in it. So I was finding a new yummy and exciting salad recipe and here I go. Wow this recipe is incredibly easy but its result is fantastic! It’s crunchy,cheesy and tasty!!! Everyone in my family love it!! Thanks a lot! Made this romaine finger salad tonight and it was absolutely divine!! I’m a very picky cook and I will say I have never had to alter, tweak, or change a single one of your recipes. Another amazing salad dish! I’m going to make this salad recipe sometime in the coming week and I cannot wait to try it! Looks so delicious!